Om svasti! I respectfully greet the Guru of non-dual primal wisdom who arises in a Vajra Kaya immune to birth and death, the innate form of the immutable, vital essence of luminosity that is fully immersed in the expanse of the mudra of great joy. Glorious Vajra, miracle of Great Oddiyana, spontaneous presence of the three Kayas, powerful and mighty Vajra Majesty, Vidyadhara of Jambudvipa, Treasure Lord of Siddhas, remember me with steadfast and heartfelt love until enlightenment. Like the whinnying horse voice of Padmisvara, the virtuosity of Tumchen Wang Drag is inherently perfect. Your life upheld the very model of a blazing vajra of yogic discipline. My only father, the Guru of my heart, remains deep in my heart. Each and every one of your fearless acts of yogic conduct and every single one of your unceasing, eloquent statements of truth and every wise and loving aspect of your unerring compassion fulfilled a Life Story of unlimited scope that is beyond our comprehension. As you inherently are Guhyapati and Padmasambhava, and so are secretly capable of rending the illusion of phenomenal existence, not trapped within the network of concepts of "birth" and "death", how could interdependent notions like "coming" or "leaving" even apply, or make any difference to you? Even so, in view of our habitual ideas that tend to hold on to things as everlasting, the image of an iron hook tugging away at one's heart still hardly describes how it is to witness the example of your departing into the expanse so suddenly. Think of me, think of me, Great Father who is so very kind. As pearl-white flowers of wistful recollections of you spring from my streaming tears of sadness and longing until they form a brimming pool in my heart, Dear Father, are you not watching me with your treasured love? At the age of 23, in the presence of Laughing Supreme Horse, you were told: "Come to Blazing Fire Mountain when seventy-six!" Entrusted with prophecies, you delightedly committed to do so. Father, is your love for your son that modest? Suddenly roused from the all too brief, pleasant dream of my father's fine home filled with warm currents of wisdom and love, I, your orphaned child who has been left entirely on my own, am so troubled, crying out my pain and grief to myself. All of the tears falling from the petals of pairs of downcast eyes of each of your disciples who hold faith and yearning for you in their hearts align in a choreographed dance of sadness, of recall and longing, that casts an overcast pall over the entire face of the globe. We, your orphaned children who feel so sad and hurt because we take imputed objects to be very real, feel tightness in our chests and cannot catch our breaths, so depleted are we of the energy spent yearning for you. At the heart of the lotus blossom of our memories of you gathers an endless stream of nectar of faith and longing. Should this uncontrived, auspicious circumstance please you, then swiftly exhibit the dancing flight of a magical bee! Put everywhere on display limitless, magical formulations of the sublime wisdom of Heroic Manjusri, which overflows from within, of the treasury of compassionate love of the White Lotus Holder, which you master, and of the glory of the power and might of the Lord of Secrets (Guhyapati), which you ably possess! I aspire that you swiftly return in the form of a Supreme Emanation who, with the dharani of perfect recall, retains all words that are heard, in whom is born deep certainty about all subjects for reflection, and for whom meditation and non-meditation arise as the true nature, free of concept-bound limitations. As soon as you are born, may the tendencies from your past training reawaken, may the forces of love, compassion and intelligence grow strong within you, and may you turn the dharma wheels of profound and vast sutra and tantra. May you take fine birth as a Master who guides all those connected to him! I pray that in a Kaya of primal wisdom whose nature is none other than Padma, bearing a boundless ocean of mind treasures, the Father's wealth, you swiftly return as a sublime, mad Terton emanation who fully alleviates the fallen fortunes of the teachings and people of Tibet. Reveal yourself right now as a King of spiritual friends who is no different from our peerless teacher, the Victor Longchenpa who holds the secret of unbounded, vital luminosity, the face of empty-aware dharmakaya that equalizes samsara and nirvana. As we are dangerously accustomed to solidifying our confused grasping and fixation, candidly appear as the executioner of obstructors in the three realms, the keeper of the unending treasury of secrecy in a Victor's form, and once more step forward as the illusory, heroic Lord of Secrets. Incorruptible vidyadhara who has mastered vajra vitality, whose infinite activity to the ends of space is spontaneously accomplished, keep us all at the forefront of your retinue in every lifetime, please arise as the undying, miraculous Master of the Sanctuary. Since we think only of you, like a forlorn child missing its mother or like someone dying of thirst yearning for water, may that for which we hope and pray, day and night, come true without delay through the blessings of the Three Jewels. With the pure aspirations of the supreme emanation Tsang Yang Jamtso and Tulku Durtrod Repa, among others, serving as an auspicious foundation, these very words of lamentation and aspiration for the swift return of a Tulku were composed by, among the progeny of the supreme Terton, the Lord of Refuge himself, the white water lily, the one to whom has been applied the name of a rebirth of Do Khyentse Yeshe Dorje, Hung Kar Dorje, even while his thoughts were taken up with faith and sadness, on the tenth day of the very same month. May the virtue of this composition at the very time when we implore our Lama Rinpoche to rouse himself from the luminous domain of dharmata bring about its fulfillment just as we request! This English translation was expeditiously prepared on the very same day by Sherab Dorje, upon whom His Holiness Orgyen Kusum Lingpa bestowed the name of Nesang Waxi Lama Dorje Nyima, a past master of His Holiness' own family lineage. 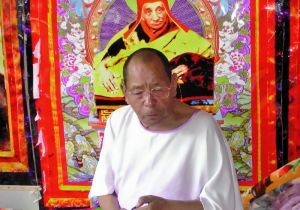 May the auspiciousness of this connection endure forever and ever, until every last one of His Holiness' aspirations and activities for the welfare of sentient beings is fully realized and accomplished. Ge'o!